Is This A Jaguar SUV? Our friends at Cars UK ran this photo over the weekend of a camouflaged Jaguar. Is it a new Jaguar SUV, or a lifted station wagon to rival the Audi Allroad? Two things seem to differentiate this Jaguar from the XF Sportbrake whose painfully slow reveal we've been sitting through for the past few months. First, you can see that the rear fenders seem a lot wider than anything Jaguar has shown of the Sportbrake. Second, though they're disguised, the lights on this particular car look different from the Sportbrake's. The question remains, is this too low to be an SUV, too wide to be a wagon, or really nothing new? 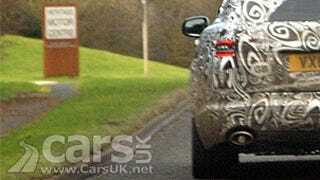 Go over to Cars UK to see the full spy photo.